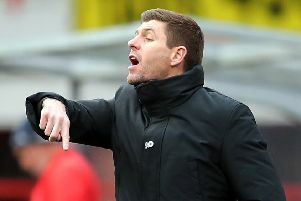 Rangers manager Steven Gerrard insists the club are determined to stamp out the “unacceptable behaviour” from the stands that has overshadowed their William Hill Scottish Cup win over Kilmarnock. Ibrox to living in the “Dark Ages” after being called a “Fenian b******” by the home supporters at Ibrox. The emotional former Scotland defender - who spent 30 years in England after leaving St Mirren in 1987 - claimed he woke up each day and thanked Chelsea for taking him away from the west of Scotland because his children do not understand the sectarian culture. Gerrard was keen to talk about the football but he backed the club’s position. When asked about his former Liverpool coach’s comments, Gerrard said: “I only saw the interview when I got home. I wasn’t aware of the interview or how Steve felt. “He came into my room after the match and he was pretty normal. It never got mentioned.